Want to remove multiple contacts from iPhone at a time? Just find your answer in this post and have a free try. Download AnyTrans to delete multiple items in Contacts, Notes, Songs and other app on your iOS device – support all iPhone/iPad models. "I haven't been able to find a way to delete more than one contact at a time. Deleting them individually is way too long since I have a lot to get rid of. Can someone tell me how to go about this?" As Estrellaltalia questioned on Apple Discussions, there is no option Apple provided to remove multiple contacts on iPhone at once. And people may face a similar problem when deleting more than one item on Notes, Music, Mail or some other app on Apple mobile devices, no matter it is on an old iPhone 4s/5 or the latest iPhone 6 Plus, and no matter it is in iOS 7 or the recently released iOS 8.4/iOS 9 beta. Anyway, Apple does not fare well on this point. In this post, we talk about how to delete multiple contacts on iPhone/iPad, and we offer you one data manager to make this deleting easily and safely. Now you don't have to delete contacts and phone numbers one by one on your iDevice. Your Device - iPhone, iPad or iPod touch. One USB cable for your device. One computer – no matter Mac or PC. AnyTrans, which is useful as one iOS data manager to manage contacts, songs, notes, pictures, and other 10+ types of files by deleting multiple items or transferring them to another place - one computer, iTunes or another iPhone/iPad. 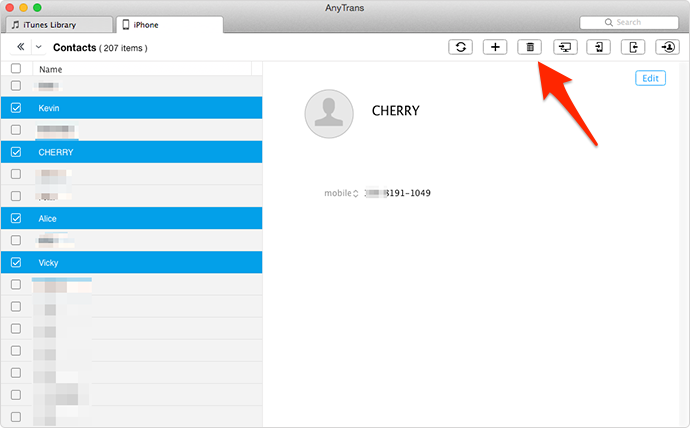 The process to delete iPhone contacts with AnyTrans is extremely simple – only 3 steps if you have downloaded AnyTrans and installed it on your computer. Step 1. Run AnyTrans and connect your device to computer by using USB cable. AnyTrans will automatically scan your contacts data. Step 2. Go to manage your iPhone contacts by clicking "Contacts". Step 3. Select unwanted contacts and numbers, and get rid of them by clicking "Delete" button at the top-right corner. 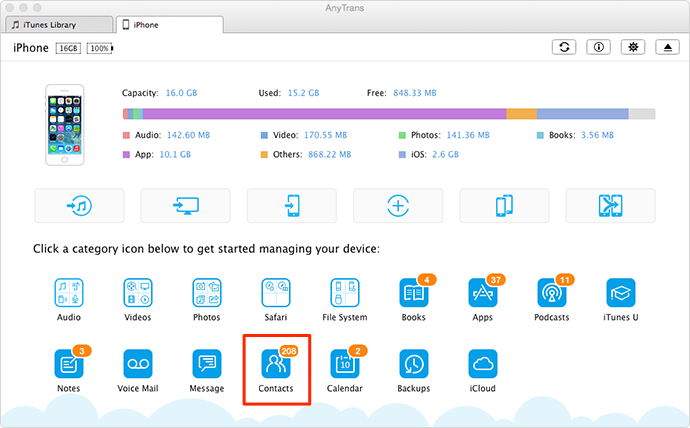 AnyTrans is developed not only for deleting contacts on your iOS device, but also for transferring data among iOS devcies and computers, and for extracting data from iTunes backup, iCloud backup and iCloud drive. So why not download it and have a free try.